The Kingdom of Denmark (Danish: Kongeriget Danmark) is the smallest and southernmost of the Nordic countries. Located north of Germany (its only land neighbour), southwest of Sweden, and south of Norway, it is in Scandinavia in northern Europe, but not on the Scandinavian Peninsula. 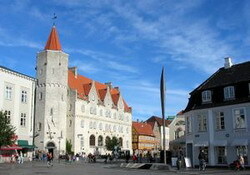 Aalborg is a city and seaport in Denmark. It is he fourth largest city in Denmark - after Copenhagen, Aarhus and Odense - with an urban population of 122,794. The earliest settlements date back to around 700 ad. 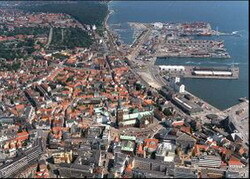 Its location by the Limfjord made it an important harbour during the middle-ages and an industrial center later. Today the city is in a transition from a working class industrial city to a knowledge based one. One of the driving forces in the transition is the University of Aalborg, founded in 1974. It is the location of Aalborg Air Base, an important base of the Danish air force, and is the seat of a Lutheran bishop. 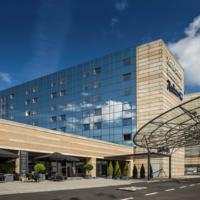 The First Hotel Aalborg is situated only 7 kilometres from the airport and 1 kilometre from the railway station. Shopping, tourist attractions and restaurants are all within walking distance from here.The hotel provides 155 rooms equipped with a private bathroom. It also has 12 suites with views across Limfjorden. Guests can dine at the fine and bright restaurant and can also relax in the bar.The conference department can accommodate up to 50 people and can be used by business guests. Other facilities include a gymnasium, sauna while activities like billiards and dart are also available. The Phonix hotel is located in the very heart of Aalborg and is within easy walking distance of all the town's attractions. The rooms vary in size but are generally medium and are kept in good condition, the bathrooms are in very good condition.The rooms combine modern facilities with the old-style nature of the building itself, which adds a certain charm to the hotel. The Brigaderen restaurant, closed on sundays, is bright and spacious with creamy-coloured walls, gold furnishings.There is also the 'Kings' restaurant available for groups which has hosted banquets for various monarchs since 1783. This hotel is an excellent base from which to explore the town.The hotel is the oldest in Aalborg and as such is a very well-preserved historical building with much to recommend it. 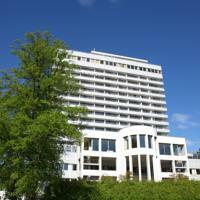 The Hvide Hus hotel is located where Aalborg city centre begins, in the green surroundings of kilde park. The rooms vary in size and are kept in good condition along with the bathrooms.Rooms are modern in design with simple but smart furnishings. There is a large open plan restaurant for groups.As well as a more exclusive panoramic restaurant on the 15th floor. 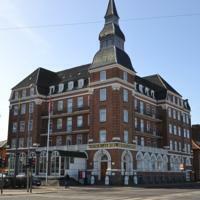 A modern, well maintained hotel with a high standard of service which would particularly suit groups. Arhus is the second largest city and the principal port of Denmark situated on the peninsula of Jutland on the northern shore of Germany. 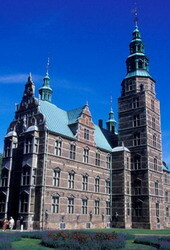 Aarhus is the seat of the council of both Aarhus municipality and Aarhus County and claims the unofficial title "Capital of Jutland". The city lies roughly in the geographical centre of the kingdom on the relatively sparsely populated peninsula of Jutland with large natural areas and preserves nearby. Forests expand from the south into the city within just a kilometre of the city centre. The city is practically built around the harbour which is predominantly industrial, although a large recreational marina is situated south of it as an extension. The Scandic Arhus Vest is a six-storey hotel, located 3.5 kilometres from the old town and four kilometres from the city centre and train station. Aarhus Tirstrup airport is 50 kilometres from the hotel, with an approximate driving time of 45 minutes. Fax and copying services are available in the business centre, and guests can stay connected via wireless internet access. The hotel houses four meeting rooms, three of which can be combined to accommodate up to 350 people, and 12 smaller breakout rooms. Complimentary parking space is provided for 200 cars. 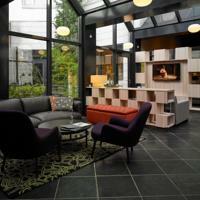 In the evenings, guests can enjoy a selection of snacks, wine and beers in the Scandic Arhus Hotel's casual bar. The sleek Radisson Blu Scandinavia Hotel, with its minimal brick exterior, is in Aarhus's Magrethepladsen, next to the music hall and Aros Art Museum and less than two kilometers from the city centre. Bold, Scandinavian design is given an international flavor with traditional English and Oriental influences in the 229 air conditioned guestrooms, many of which have views of the city. All rooms feature complimentary wireless internet connections, direct dial telephones and cable television. Guests staying at the Radisson Sas Scandinavia can while away their stresses or work up a sweat in the fitness center, which includes a sauna, gym and massage rooms. Those in need of pampering can take advantage of the hair and beauty salon. Odense is the third largest city in Denmark with 145,554 inhabitants (Odense city January 1, 2004) and the capital of the island of Funen. It is the seat of both Odense municipality and Funen County. The city lies close to Odense Fjord on the Odense River. It is a station on the railway route between Copenhagen and Jutland, the peninsular mainland. A canal dug from 1796 to 1806, 7.5 metre (25 ft.) deep, gives access to the town from the fjord. Accessibility to Odense was greatly increased when ferry service between the two main Danish islands, Zealand and Funen was replaced by the Great Belt Bridge (opened in 1997 for rail traffic, 1998 for road traffic). The bridge is the second longest suspension bridge in the world. Its construction greatly cut transportation time between Odense and the Danish capital, Copenhagen. Copenhagen can now be reached by trains from Odense in 1 hour and 15 minutes. 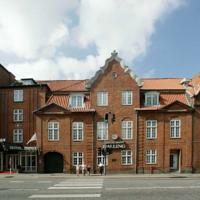 This historic Odense hotel is opposite the Kongens Have Park and 300 m from the Central Station. 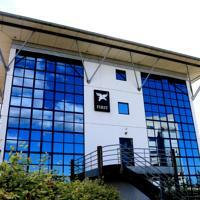 It offers a gym and solarium and free Wi-Fi, films and hot beverages. Hotel Plaza was built in 1919. Each guest room includes a flat-screen TV with satellite channels and a free weekday newspaper. Guests are served free fruit and afternoon cookies. Plaza Hotel provides a free communal internet computer in the lobby. The 24-hour reception sells snacks and other items. Nearby attractions include the Brandts Klaedefabrik Museum, which is 800 m from Hotel Plaza. The H.C. Andersen Museum is less than 15 minutes’ stroll away. 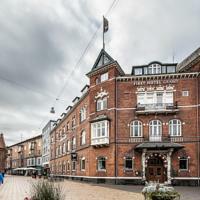 The Grand hotel is located in the centre of Odense a short walk from the pedestrianised shopping and restaurant area of town.The location is a very tranquil one. The rooms vary in size but are generally medium and are kept in good condition along with the bathrooms.Rooms are quite different in the colourings used.There are traditional touches, but most of the furnishings are modern in style. This is located on the gound floor and is a large room with high ceilings and marble pillers giving a Grand feel. A classy traditional hotel with a good level of modern comforts and service.